I had arranged to meet Neal from Spool Photography at Burke Drive in Bicton for an afternoon shoot on Friday afternoon, however it was not to be due our timings. Whilst standing at Burke Drive I couldn’t help but feel that it was going to be a decent sunset but that I was in the wrong place. Does anyone else get a ‘feeling’ about these things? I decided I would head over to Attadale instead and I had given up shooting the sunset as I didn’t think I would arrive there on time to capture it. I must admit I was extremely surprised and pleased when I turned up to see this beautiful sunset appear in front of me. It gets so frustrating to go out weeks on end only to come home with nothing, so this made a fantastic change. Did anyone else manage to capture this sunset on Friday evening? On another note, Tony Middleton has written an extremely poignant post about what is happening with the bush fires in Victoria. My heart is certainly with the people in Victoria. 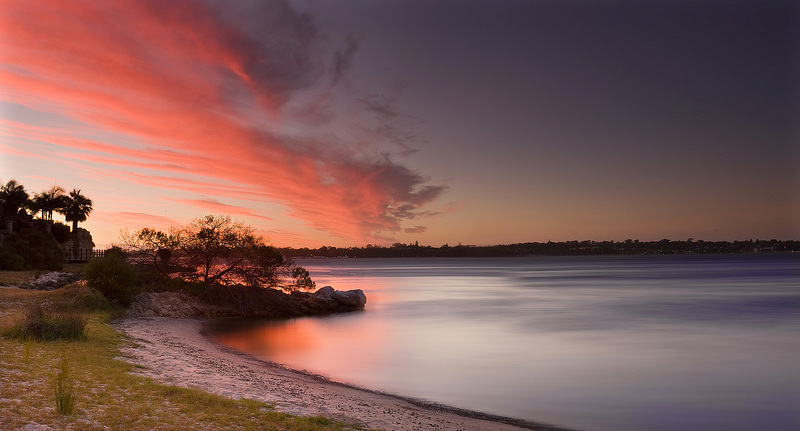 This entry was posted in Australian Landscapes and tagged applecross, attadale, australia, bush, canon, fires, image, Jamie Paterson, landscape, long exposure, panorama, panoramic, perth, photo, photography, reflections, river, seascape, sunset, swan, victoria, western australia. Great colours in the sky, and I love the texture of the water. i really love the left half of this. around that headland and up to the cloud is just magic!